A synergistic formula of 7 rainforest botanicals traditionally used in South America for bowel function. 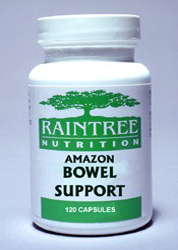 For more information on the individual ingredients in Amazon Bowel Support, please go to the plant database files in the Tropical Plant Database. Each rainforest botanical in this professional formula has been sustainably harvested in the Amazon Rainforest. This product contains no binders, fillers, or exipients and is 100% finely milled natural plants. This product is backed by Raintree’s Unconditional Guarantee. Ingredients: A proprietary blend of cat’s claw, macela, boldo, simarouba, jurubeba, tayuya, and anamu. This formula is 100% pure natural ground plants. No binders, fillers or other additives are used. These plants have grown naturally in the richness of the Amazon without any pesticides or fertilizers. Suggested Use: Take 2-3 capsules three times daily on an empty stomach. This product should not be used with medications intended to suppress the immune system. Drug Interactions: May potentiate blood thinning medications such as Warfarin. May reduce the effect of immune suppressants. Several plants in this formula contain a low concentration of coumarin which has an anticoagulant effect. People with blood disorders such as hemophilia, or those on blood thinning medications should be monitored closely. Cat’s claw and jurubeba have been documented to have an antifertility effect. Those seeking to become pregnant or those undergoing treatment for infertility should not use this formula.